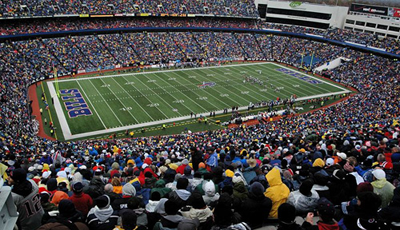 With about 12,200 tickets left for the game as of late Monday, the Bills seem unlikely to sell out the game in time to prevent the local TV blackout. “I think it will be a daunting challenge to move that amount of inventory in the time allotted,” Russ Brandon, Bills chief executive officer, said late Monday afternoon. “But we’ll do everything in our power to sell every ticket we can.” That includes working with the team’s corporate sponsors and business partners to move as many tickets as possible. There is one little-known provision, dubbed by some as the National Football League’s “dirty little secret,” that could allow the Bills to televise the game. The “34-cent rule” allows the home team to “buy” the remaining unsold tickets at 34 cents on the dollar, to fund the visiting team’s share of ticket revenue. But don’t expect the Bills to pursue that angle. “It’s not something that we’re interested in participating in, because it devalues our product,” Brandon said.